36 n Performance & Hotrod Business n February 2015 PERFORMANCE available in Denver. It's amazing to me how things like this happen. 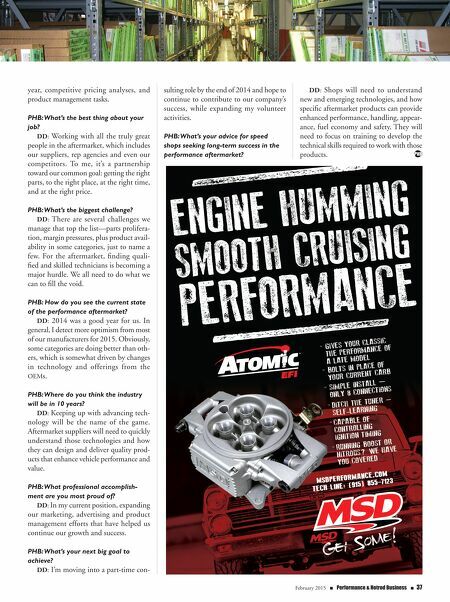 PHB: Tell us about your company and its place in the performance aftermarket. DD: Engine & Performance Warehouse is a traditional warehouse distributor that specializes in engine kits, engine parts, a variety of high-performance components and shop supplies. Our distribution model is very tra- ditional. We sell only to automotive machine shops, qualified engine builders and auto parts stores. A key to our success is our 12 branch warehouses that are stra- tegically located in the western half of the U.S.—96-percent of our customers receive their orders the next day, and customers near one of our warehouses can pick up their orders the same day. We stock 110 product lines and main- tain the highest order fill in the business. PHB: What's a typical day like for you? 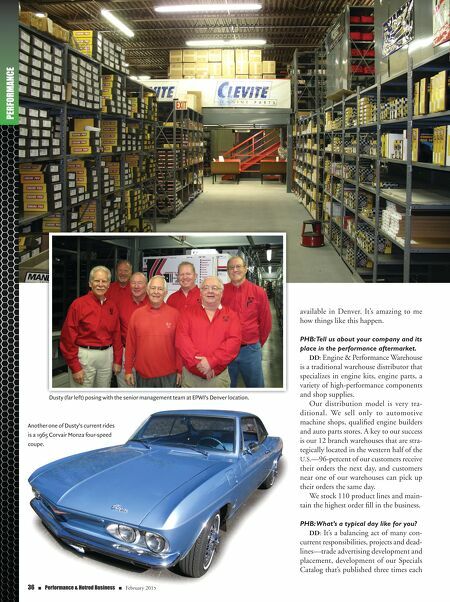 DD: It's a balancing act of many con- current responsibilities, projects and dead- lines—trade advertising development and placement, development of our Specials Catalog that's published three times each Dusty (far left) posing with the senior management team at EPWI's Denver location. Another one of Dusty's current rides is a 1965 Corvair Monza four-speed coupe.